The winter is a tough time for your roof. With the storms, heavy rain, and snow, it’s hard to keep your roof in top condition. Just like any situation with your home, it’s best to have a plan of attack in order to prevent any problems. Here are some tips to help you prepare and protect your roof. Regular Inspections – Scheduling regular inspections for your home is important. Whether you want to check it yourself or hire a professional, you should be keeping an eye out for any problems regarding your roof. Look for any missing shingles or tiles, as well as any cracks or leaks. If your roof is visibly uneven and spotty, it might need replacing. Clear Your Gutter – If you leave your gutters filled with snow, it will eventually freeze and cause an ice dam to form. Ice dams block water from escaping your roof, so instead, it will make it’s way into your home. Clean your gutters to make sure you don’t cause roof damage and in turn high repair costs. Trim Nearby Trees – Are there any trees near your home? Check the tree branches that hang over your roof. If the branches are old, they will break with the weight of the snow. This will cause problems for your roof and gutters. Invest In A Roof Rake – If there is more than four feet of snow on your roof, a roof rake will come in handy. 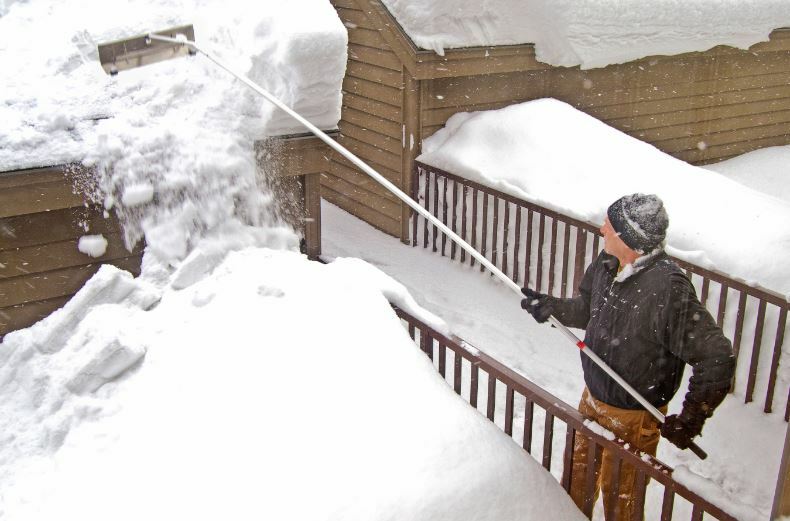 A roof rake has a long handle, allowing you to reach certain areas to pull the snow off your roof. Roofing jobs can be dangerous, if you have any doubts, hire a roofing specialist. Purchase Repairs – DIY roofing jobs aren’t as easy as they look. Before you go outside and tend to the problem yourself, hire a professional. They will provide an inspection, work on any repairs, and install a new roof if need be.